President Trump fired FBI Director James Comey on Tuesday, saying he'd lost confidence in his ability to manage the bureau. This capped a difficult year for Comey, whose handling of the Hillary Clinton email investigation drew scrutiny from both sides of the aisle. Shortly after the news broke, CNN reported that it learned of federal subpoenas seeking business records related to Michael Flynn in the hours before Comey's firing, in an apparent expansion of the FBI's investigation into ties between Trump associates and Russia. White House officials are denying that Comey's firing had anything to do with the probe — deputy press secretary Sarah Huckabee Sanders has said it's time to move on from the Russia investigation entirely. Meanwhile, Trump has gone after Chuck Schumer. He will meet Wednesday in the Oval Office with Russian Foreign Minister Sergey Lavrov. What happened? Trump informed Comey in a letter that he was terminated "effective immediately." CNN reports Trump's private security guard may have delivered the letter to the FBI, but Comey was in Los Angeles. Per NYT's Michael Schmidt, he was addressing FBI employees there when news of his firing flashed on T.V. screens in the background, and he originally thought it was a prank. What did Trump say? He appreciated Comey informing him "on three separate occasions that I am not under investigation" but "you are not able to effectively lead the bureau." Was it really so sudden? Per Schmidt, "WH and DOJ had been working on firing Comey since at least last week. Sessions had been working to come up with reasons." What happens next? Deputy FBI Director Andrew McCabe will serve as acting director until a permanent replacement is nominated. The position requires Senate confirmation. How are Republicans reacting? Most are lining up behind Trump but Senate Intelligence chairman Richard Burr said he was "troubled by the timing and reasoning of Director Comey's termination," and John McCain has renewed his call for an independent Russia investigation. What did Obama and Clinton say? "No comment," via their spokespeople. "The appointment of a successor to Mr. Comey could touch off a furious fight since anyone he would choose would automatically come under suspicion. A confirmation fight could easily distract Mr. Trump's White House at a time when it wants the Senate to focus on passing legislation to repeal former President Barack Obama's health care law." "Serious question: Where are Comey's files right now? Who controls them? After Nixon fired special prosecutor, office was sealed. Important." "The FBI Director serves a ten-year term precisely in order to insulate against the whims of a President who does not like what—or whom—the FBI is investigating. While the President has legal authority to fire an FBI director, the fact that Trump has done so under circumstances of an active FBI investigation of the President's own campaign violates profoundly important norms of an independent, non-political FBI." "If Trump thinks he had problems w/leaks before, just wait. 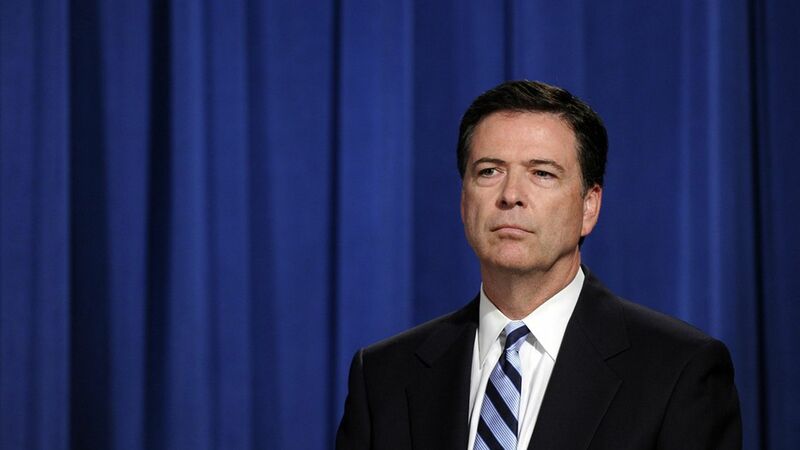 He abruptly fired the leader to whom many FBI folks are loyal. Blowback is coming." Today, President Donald J. Trump informed FBI Director James Comey that he has been terminated and removed from office. President Trump acted based on the clear recommendations of both Deputy Attorney General Rod Rosenstein and Attorney General Jeff Sessions. "The FBI is one of our Nation's most cherished and respected institutions and today will mark a new beginning for our crown jewel of law enforcement," said President Trump.A search for a new permanent FBI Director will begin immediately. "... you are hereby terminated and removed from office, effective immediately. While I greatly appreciate you informing me, on three separate occasions, that I am not under investigation, I nevertheless concur with the judgement of the Department of Justice that you are not able to effectively lead the bureau." "As Attorney General I am committed to a high level of discipline, integrity, and the rule of law to the department of justice- an institution that I deeply respect. Based on my evaluation, and for the reasons expressed by the deputy attorney general in the attached memorandum, I have concluded that a fresh start is needed at the leadership of the FBI." "Over the past year, however, the FBI's reputation and credibility have suffered substantial damage, and it has affected the entire department of justice...."As you and I have discussed, however, I cannot defend the director's handling of the conclusion of the investigation of secretary Clinton's emails, and I do not understand his refusal to accept the nearly-universal judgement that he was mistaken. Almost everyone agrees that the Director made serious mistakes; it is one of the few issues that unites people of diverse perspective."